December 30th 2009 is an important day in the history of Shillong LajongAi? ?Football Club. With the charismatic Stanley Rozario blurting out instructions from the sidelines, his young wards from the scenic North Eastern hill station of Shillong created one of the biggest upsets in theAi? ?Indian footballAi??history. Playing against the then I League champions Churchill Brothers in Guwahati for a place in the final of the Federation Cup, with thousands of vociferous fans backing them up, the boys from Shillong played the game of their lives to stun the league champions and reach the final. Three days later, the ai???redsai??i?? went on to lose narrowly in penalties to East Bengal, holding the Kolkata giants for 120 minutes despite missing a majority of their senior players through suspensions and injuries. It was in this tournament that the reds had truly arrived onto the national stage.Ai? ?Despite them failing to escape relegation 6 months later, the boys from northeast eventually returned to the scene a season later, after winning the second division of the I League. In their second coming into the I League, Lajong finished in the bottom half of the table, this time managing to survive relegation. Pradhyum Reddy, who had succeeded Stanley Rozario, also helped his boys reach the Federation Cup semis, where they narrowly lost to Salgaocar. With expectations quite high from its fans for the coming season, the club decided to make a few changes, the biggest one being the arrival of former Indian U-23 coach Desmond Bulpin. The Scotsman has already set about making preparations for the season ahead, with a view to taking the club to the next level. Since shooting into fame with its dream run in the 2009/10 Federation Cup, Shillong Lajong have come up with some decent showings in cup competitions, most recent being the semi-final appearances in last seasonai??i? ?s Federation Cup and Durand Cup. It is no secretAi? ?that the ai???redsai??i?? will be heavily banking on the cup competitions this season as well for winning some major silverware. On the other hand, Des Bulpin, who has previously worked with top clubs like Tottenham Hotspur andAi? ?Queens Park Rangers will try to leave no stone unturned in making sure that the Shillong-based club betters its performance in the league. 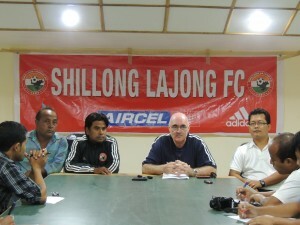 Lajong’s I-League 2011/12 season was wasAi? ?plagued by defensive lapses and failure to convert chances. In fact, 2011/12 season could have turned out in the same vein as 2009/10 (when Lajong were relegated from the I League) had it not been for the dismal showings of HAL and Chirag Kerala. In a recent interview to the official website of the club, Bulpin voiced his concerns aboutAi? ?Lajong’s defensive and finishing frailties. ai?? ?Obviously, there is a problem at the back for conceding goals and there is a massive problem up front for scoring goals,ai??? Bulpin said. The Scot further stressed on the need for grooming the youth in the club for its long term needs. Keeping in mind the defensive weakness, Lajong have brought in some fresh faces at the back in the form of Rollingson Hungyo, Govin Singh and North Korean U-23 defender Minchol Son while senior defender and former captain Aibor Khongjee has left for Mohun Bagan.Ai? ?Former United Sikkim goalkeeper Basant Singh has been added to the Shillong Lajong roster as well. The club already has retained the services of most of its talented players. Young defender Ronald Zolthanzama, who was promoted to the senior side last season and had done pretty well in the few games heai??i? ?s featured in, will be looking forward to impress his new coach withAi? ?more solid displays. With these new recruits at the back, the club would be eager to put last seasonai??i? ?s erratic displays behind them. Midfield is the only area whereAi? ?Lajong has been putting up some decent performances throughout last season. With Renedy Singh joining in middle of last season, Lajongai??i? ?s midfield is now a blend of youth and experience. The experienced medio, now the captain of Lajong, will be well supported by the likes of Lalramluaha Hmar, new recruit Jibon Singh, fan favourite John Menyongar. Menyongar, who prefers the role of a second striker, will be the man to look watch out for this season.Ai? ?Talented winger Eugeneson Lynghdoh, who impressed last season with some terrific displays on the flanks, will be out to give nightmares to opposing fullbacks. Eugeneson, who had been one ofAi?? three players to attend specialised training with FC VestsjAi? ?lland, alongiside Lalramluaha and Lalthummawia, is one of the best upcoming talentsAi? ?in the country right now. With so much being spoken about him in recent times, the local lad from Shillong wouldnai??i? ?t want to disappoint any of his fans.Ai?? Last season, Shillong Lajong had one of the worst goalscoring records in the league. In 13 home games, the ai???Redsai??i?? could find the net only on 12 occasions. This forced the club into bringing in national team forward Sushil Kumar Singh to add more steel up front, whereas Lalnunmawia, a youth team player, was promoted to the senior side. With James Gbilee, Seikhohao Tuboi, Christopher Chizoba and Osvaldo Mayora failing to put up consistent performances up front, the duo of Sushil Kumar and Lalnunmawia had done comparatively well in the later stages of last season. This season, the strikers will have to do much better than last season, if the clubai??i? ?s ambitions of making it to the top half of the league table are to come true. The transfer of Indonesia born Nigerian Gbeneme Friday is bound to add more firepowerAi? ?to Lajong attack. Friday was one of the few bright spots for Mumbai FC last season, notching up 11 goals in I-League. His best performances included a Man of the Match showing against Lajong in an important encounter in early 2012. His performance in that match might have played a role in his eventual move. With many new faces in the club, expectations are high among the fans. Des Bulpin, who has already worked with Pailan Arrows (formerly Indian Arrows), has already called for support from theAi? ?Lajong fans through the good and bad times. Whether the fansai??i?? expectations are justified, would be known come the end of the season.Ai? ?